WPW040071 WALES (1932). 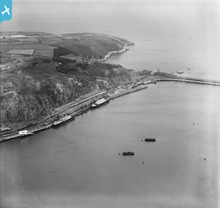 View of Fishguard harbour, oblique aerial view. 5"x4" black and white glass plate negative. Title [WPW040071] View of Fishguard harbour, oblique aerial view. 5"x4" black and white glass plate negative. The Great Western Railway ran the ferry service at Fishgurard. It also ran the port of Rosslare in Ireland. 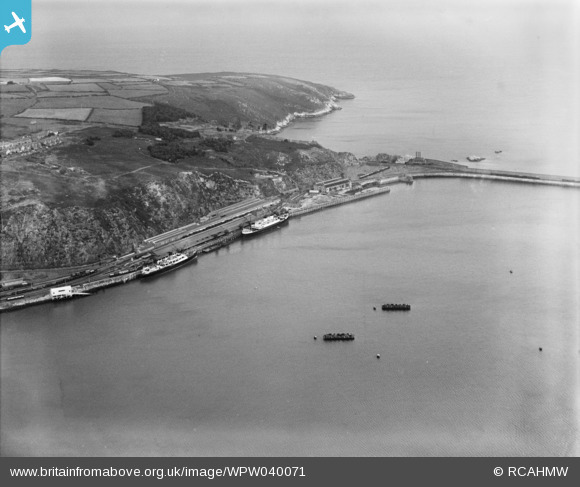 Besides the Fishguard-Rosslare service, vessels also ran to Waterford and Cork from this port. One of the vessels seen here may have been the St Andrew of 2,702 tons, or its sister ship, the St David. Both were built for the Rosslare service by Cammell Laird in 1932. The St Andrew survived into British Railways service and was used on sailings until 1967. The St David was sunk in 1944.